This is part of a series on the elements of Customer Experience #CX. Customer Service is one of the core elements that help shape a customer’s pre and post-sale experience, and contribute significantly to both a positive user experience (#UX) and customer experience (#CX) – the sum total of a customer’s experience with a product or brand. The best customer service is the kind that doesn’t carry the “customer service” label – it’s baked into the system in a way that makes it seem natural, and occurs without having to ask. You shouldn’t have to call customer service to experience it. When it occurs organically it creates solid trust points and reinforces an overall perception of a brand. Equally important is the idea that customer service isn’t always about fixing a customer’s issue – it’s often about giving customers the tools they need to help resolve an issue by themselves. It’s about education, awareness and an occasional nudge in the right direction. Here’s a great example of “embedded customer service” and “providing the right tools” in action (the genesis of this post). I bought a Jetta in 2009 from a local VW dealer. Like many, I openly admit I don’t use their service center – a classic case of “I know a guy” that I’ve been using for years. 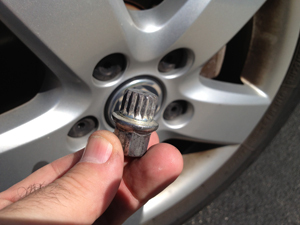 Last week when I brought my car in for service, I realized the keyed lug for the wheel lock was missing. No keyed lug, no tire removal. No tire removal, no service. Pretty clear next step: call the VW dealer. The Parts Department at the VW dealership told me to swing by – there were over 40 possible combinations for my particular car and they’d have to go through the boxes until one-by-one until we found the right one. 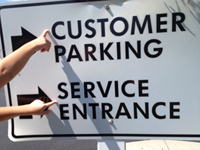 We arrived and parked in the Customer Parking section outside the Service Entrance and went inside. They were right about the number of possibilities. The parts desk agent was well into our second box of lug locks when we found the right one, but it wasn’t in stock. They found one for me at a different dealership, but I was heading out of town and wouldn’t be able to stop by the other dealership for a few days at best. That’s when they got creative and came up with a temporary fix – rather than delaying the service, I could replace the keyed lugs (4 of them) with regular lugs until I could get the key after my trip. Sold. 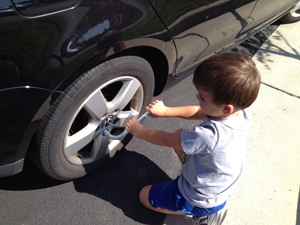 I was in a rush, and they were full up, so they offered to lend me their key and the tools my son and I needed to swap the four lugs, which we did (he thought he was playing racing pit crew). I returned the key and the tools to the parts department. My son was pretty excited and started giving high-fives all around (that’s what a pit crew does, isn’t it?). As we were walking back out to the car we ran into another member of the Parts Department who had been out in the parking lot looking for us. It wasn’t until after he introduced himself that I realized he was the person who had taken my initial call (he was both our initial and closing contact in this experience). He had overheard the conversation about the lug swap and realized that the four lugs used a different lug cover than they keyed lugs. Even though they would be replaced within a few days with the original keyed lugs, he had four new lug covers in his hand. And yes, I’m rethinking the whole “service at the dealership” issue now. > Many thanks to Maurice and Louis of Lindsay Volkswagen, especially for the high-fives! Prev I Make Pancakes. What Do You Do? Next Good Customer Service Has No Price. It’s Priceless.